Population of Saint-Georges-de-Reintembault was 1 626 inhabitants in 2007. You will find below a series of charts and statistical curves of population census of the town of Saint-Georges-de-Reintembault. 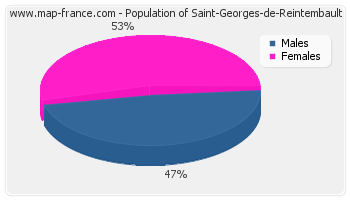 Population of Saint-Georges-de-Reintembault was 1 681 inhabitants in 1999, 1 747 inhabitants in 1990, 1 795 inhabitants in 1982, 1 818 inhabitants in 1975 and 2 049 inhabitants in 1968. Area of Saint-Georges-de-Reintembault is 31,02 km² and has a population density of 52,42 inhabs/km². Must see: housing of Saint-Georges-de-Reintembault, the road map of Saint-Georges-de-Reintembault, the photos of Saint-Georges-de-Reintembault, the map of Saint-Georges-de-Reintembault. Population of Saint-Georges-de-Reintembault was 1 626 inhabitants in 2007, 1 681 inhabitants in 1999, 1 747 inhabitants in 1990, 1 795 inhabitants in 1982, 1 818 inhabitants in 1975 and 2 049 inhabitants in 1968. This population Census of the town of Saint-Georges-de-Reintembault was made without duplicated data, which means that each Saint-Georges-de-Reintembault resident that have ties to another municipality is counted only once for the two municipalities. This curve shows the history of the population of Saint-Georges-de-Reintembault from 1968 to 2007 in cubic interpolation. This provides more precisely the population of the municipality of Saint-Georges-de-Reintembault the years where no census has been taken. - From 1999 and 2007 : 154 births and 252 deaths. - From 1990 and 1999 : 177 births and 280 deaths. - From 1982 and 1990 : 158 births and 273 deaths. - From 1975 and 1982 : 158 births and 231 deaths. - From 1968 and 1975 : 185 births and 201 deaths.